LäGzz announced the release of the video PURE WHITE LIGHT! This is the title track of the upcoming CD, to be released on February 23, 2018 by THE BUT! MUSIC GROUP. This entry was posted in Film, Food and Drink, Germany, Guest Blogger, Guitars, Music, People Watching, Poetry, Video, Writing and tagged #dance, #edm, #guitar, #musicvideo, Music on January 27, 2018 by lauralibricz. In 1976, furniture designer Ned Steinberger and luthier buddy Stuart Spector got together in Brooklyn, NY and developed a new electric bass called the Spector NS2. The ‘concave / convex’ body form, designed by Ned, became the distinguishing factor for Spector Basses. After that, Ned’s interest in the music industry grew and he pulled out all the stops. He went on to develop some of his more innovative designs. The headless bass was born and the rest is history. The unique construction of the Steinberger L-Series headless bass and it’s design made it a real eye-catcher. The neck and body were one solid construction molded out of carbon fibers. The body was then covered with a plastic face plate that also housed the electronics. The neck contained no truss rod, that metal rod inserted in the neck used to adjust the curve of the neck. The curve, or relief, was built into the neck and optimized with the frets. Because there was no headstock, the tuning pegs were incorporated into the bridge and string change was a breeze using the double-ball stings. In the early 80’s, Ned got some cheap factory space in Newburgh, NY and moved shop upstate. Shortly thereafter, a six-string guitar version was launched and Ned’s ground-breaking transposing tremolo system, the Trans-Trem. It was at that time, in 1985, that I started working in the fret department. The necks were pre-formed in a machine so that we could install the frets with little or no top-levelling. This procedure for ‘calculating the deflection of carbon graphite necks as they were displaced by the cumulative effects of installed fret pressure’ was developed by Ned and Jeff Babicz. Other new models were released. I transferred into the assembly department and worked on the P-Series project: molded necks bolted onto wooden bodies. Guitarist Mike Rutherford of Genesis inspired the M-Series, a molded neck bolted to a more-traditionally shaped body, built by English luthier Roger Giffin. 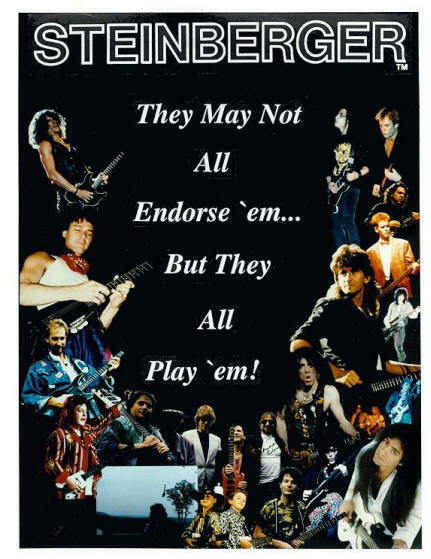 Steinberger never officially endorsed artists. The artists just played the instruments. 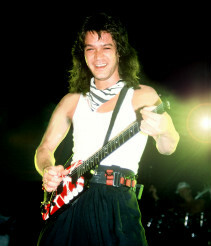 At this time names like Eddie Van Halen, Rick Derringer, Geddy Lee and many others were touring with their Steinberger guitars and basses. But, alas, every story has an ending. On my last day, in the summer of 1987, the big blond guy from Gibson came by and bought the company. At that point, the NY company was producing over 25 guitars and basses a week. Eventually, the NY factory was dismantled and the operation was moved to Nashville. This entry was posted in Guitars, Music, People Watching and tagged #electricguitar, #guitar on October 10, 2016 by lauralibricz.